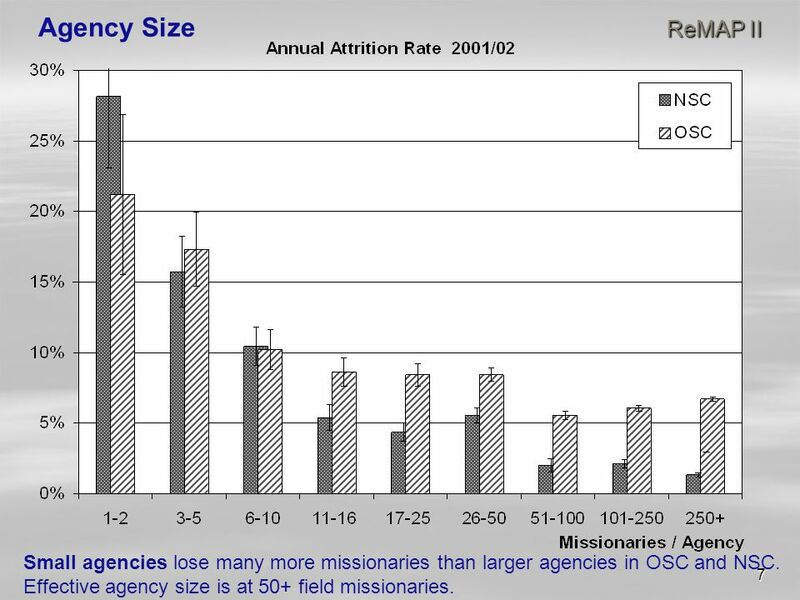 7 7 ReMAP II Agency Size ReMAP II Small agencies lose many more missionaries than larger agencies in OSC and NSC. Effective agency size is at 50+ field missionaries. 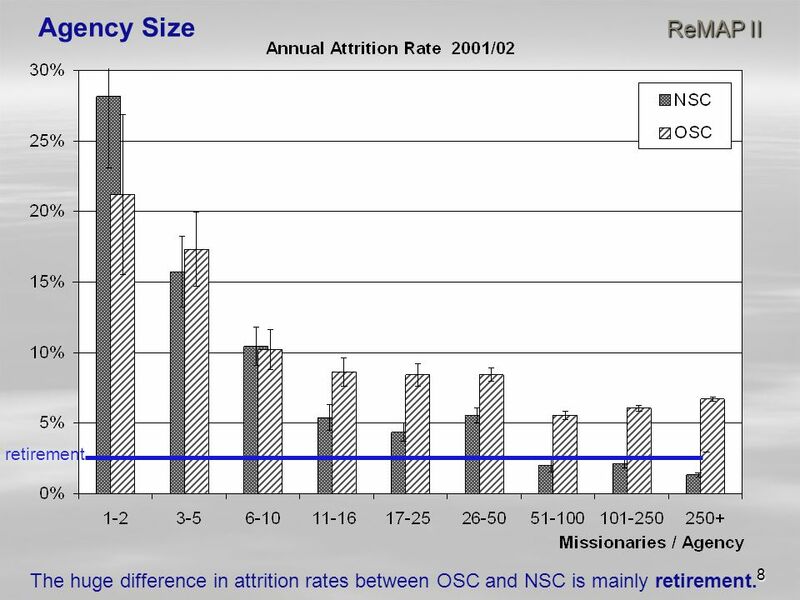 8 8 ReMAP II Agency Size ReMAP II retirement The huge difference in attrition rates between OSC and NSC is mainly retirement. 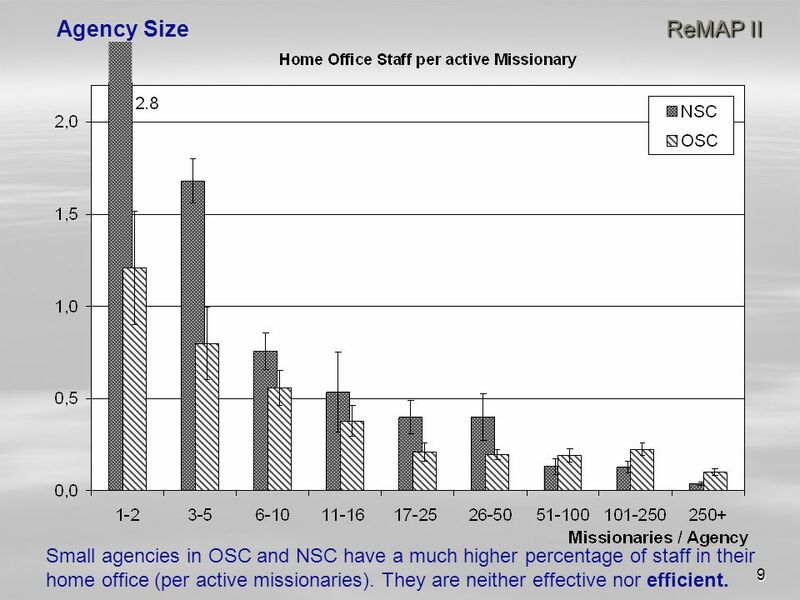 9 9 ReMAP II Agency Size ReMAP II Small agencies in OSC and NSC have a much higher percentage of staff in their home office (per active missionaries). They are neither effective nor efficient. 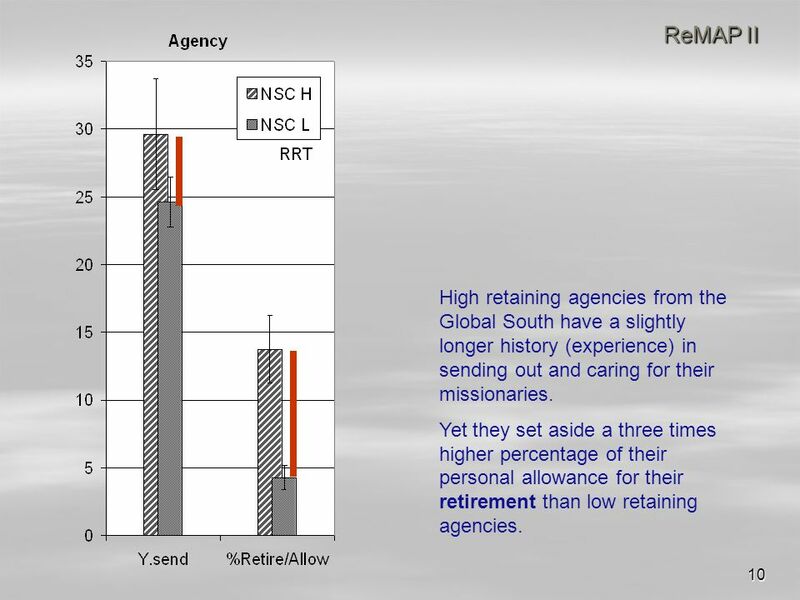 10 10 ReMAP II High retaining agencies from the Global South have a slightly longer history (experience) in sending out and caring for their missionaries. Yet they set aside a three times higher percentage of their personal allowance for their retirement than low retaining agencies. 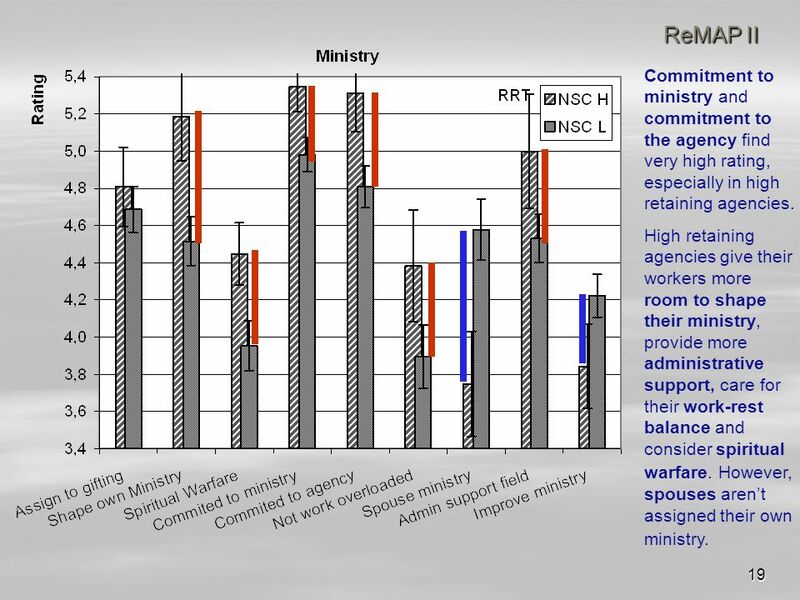 11 11 ReMAP II High retaining agencies have marginally more missionary families with children (and thus educational needs), yet they have fewer staff in the home office. Apparently they operate with an effective and lean team to provide all the services that are confirmed in this survey. 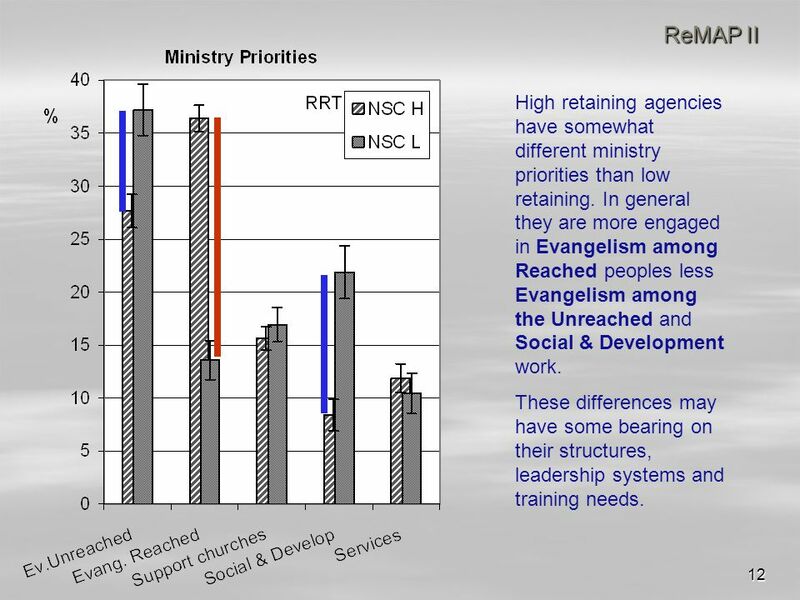 12 12 ReMAP II High retaining agencies have somewhat different ministry priorities than low retaining. In general they are more engaged in Evangelism among Reached peoples less Evangelism among the Unreached and Social & Development work. These differences may have some bearing on their structures, leadership systems and training needs. 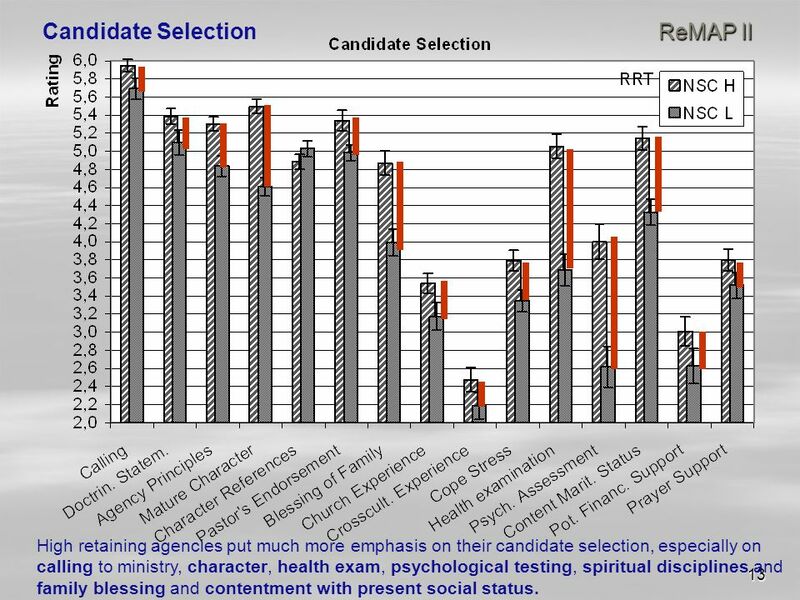 13 13 ReMAP II Candidate Selection ReMAP II High retaining agencies put much more emphasis on their candidate selection, especially on calling to ministry, character, health exam, psychological testing, spiritual disciplines and family blessing and contentment with present social status. 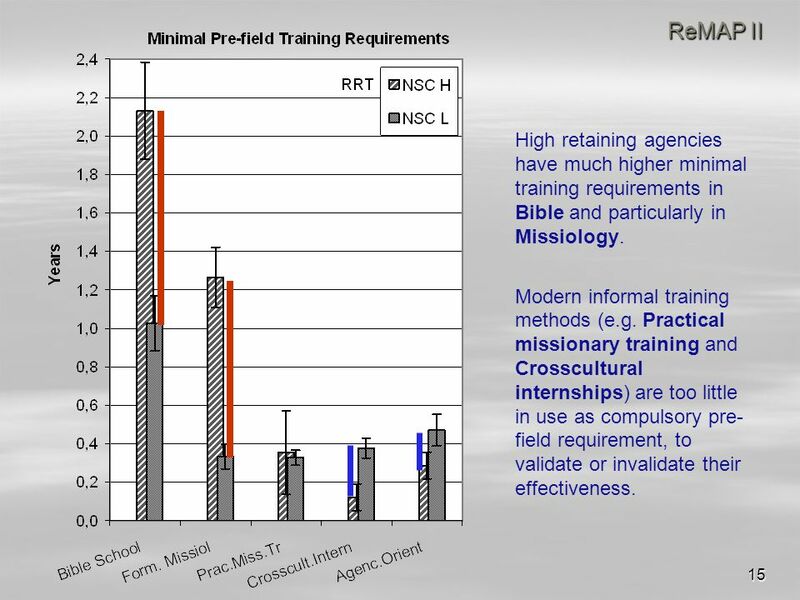 15 15 ReMAP II High retaining agencies have much higher minimal training requirements in Bible and particularly in Missiology. Modern informal training methods (e.g. Practical missionary training and Crosscultural internships) are too little in use as compulsory pre- field requirement, to validate or invalidate their effectiveness. 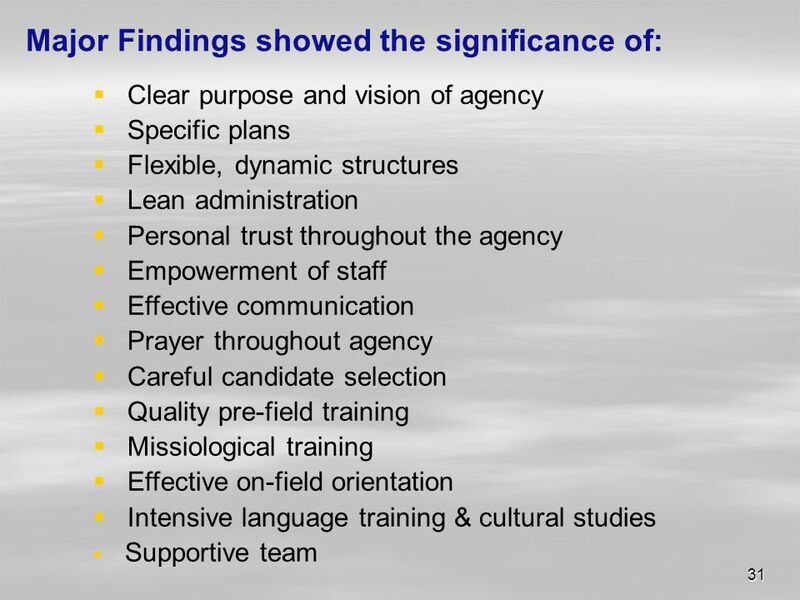 16 16 ReMAP II ReMAP II Prayer throughout the agency finds high rating in all agencies. High retaining agencies put much more emphasis on their vision state- ment, specific plans & job descriptions, communication between field and home and have well documented policies. Yet they do not include their missionaries as much in the decision making on the field. 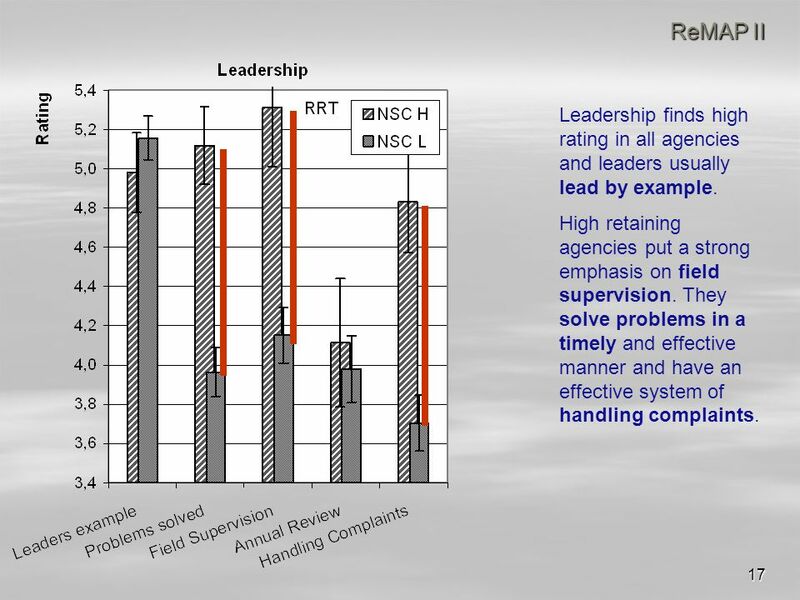 17 17 ReMAP II Leadership finds high rating in all agencies and leaders usually lead by example. High retaining agencies put a strong emphasis on field supervision. They solve problems in a timely and effective manner and have an effective system of handling complaints. 18 18 ReMAP II High retaining agencies put more emphasis on field orientation. Language learning and ongoing cultural studies find less emphasis, possibly because more missionaries work in near cultures where language and cultural learning is not (considered) as important. 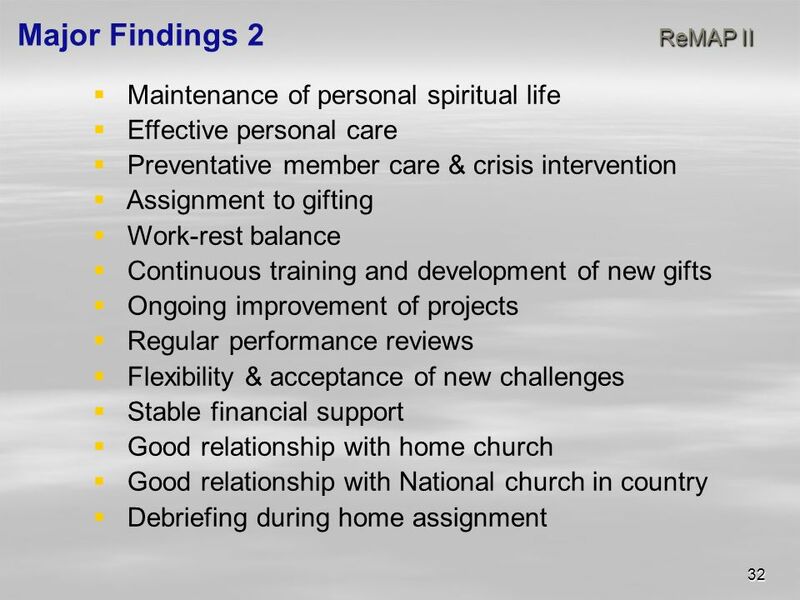 Life-long learning and development of new gifts find high rating. 19 19 ReMAP II Commitment to ministry and commitment to the agency find very high rating, especially in high retaining agencies. High retaining agencies give their workers more room to shape their ministry, provide more administrative support, care for their work-rest balance and consider spiritual warfare. However, spouses aren’t assigned their own ministry. 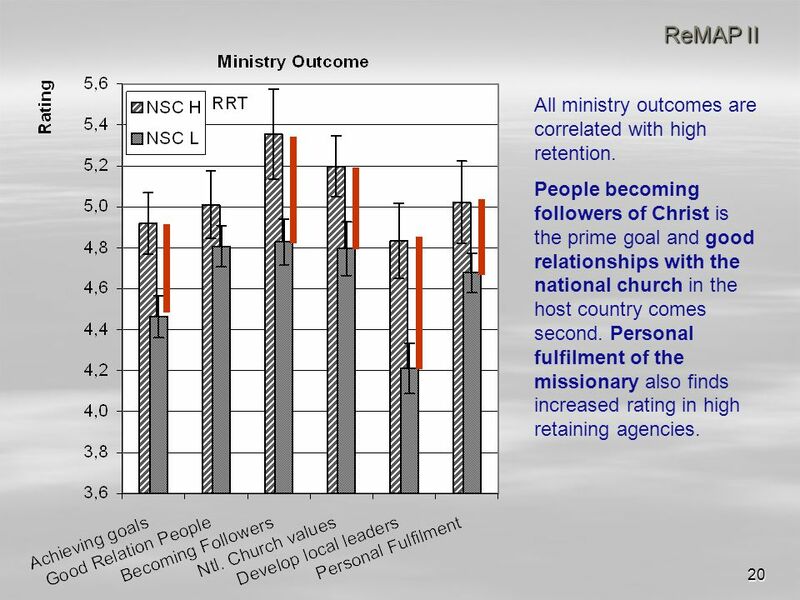 20 20 ReMAP II All ministry outcomes are correlated with high retention. People becoming followers of Christ is the prime goal and good relationships with the national church in the host country comes second. 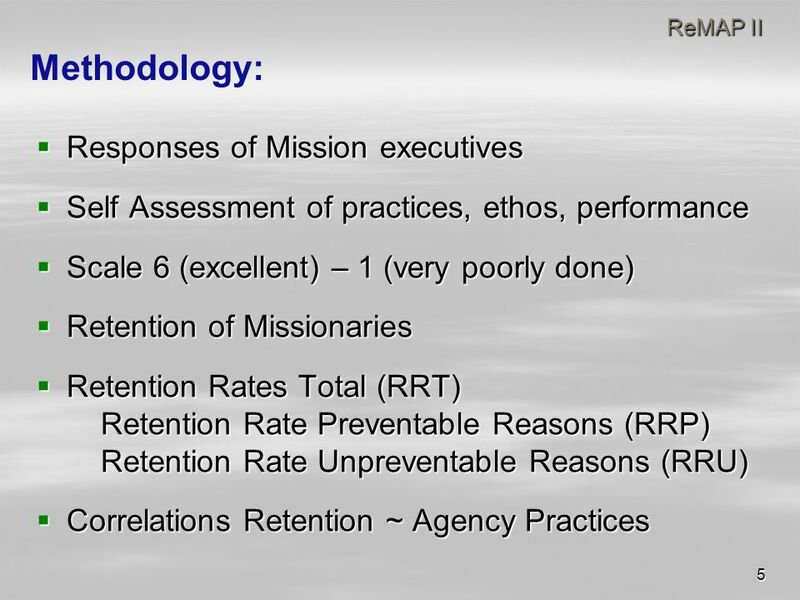 Personal fulfilment of the missionary also finds increased rating in high retaining agencies. 22 22 ReMAP II Agencies with little member care suffer a high attrition rate. Attrition comes down with increasing of MC. 10-20% of total staff time (in home office and on the field) appear to be optimal. 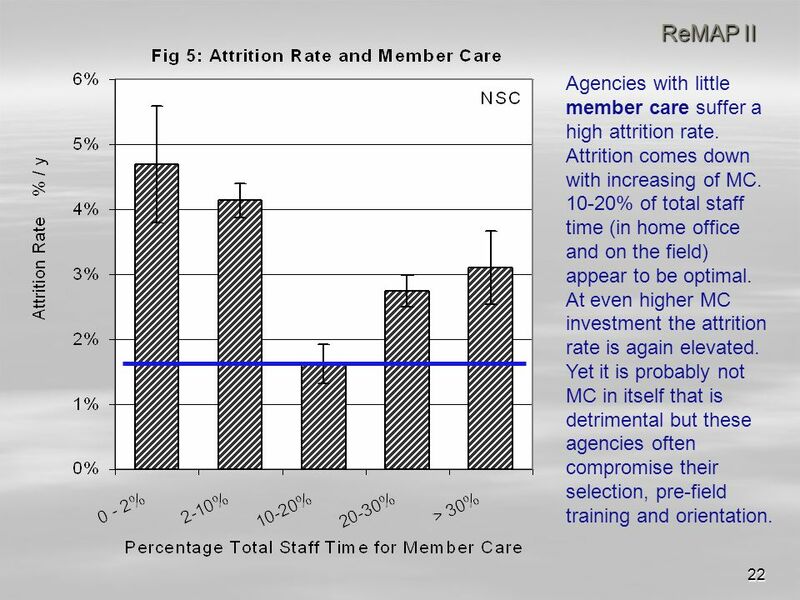 At even higher MC investment the attrition rate is again elevated. Yet it is probably not MC in itself that is detrimental but these agencies often compromise their selection, pre-field training and orientation. 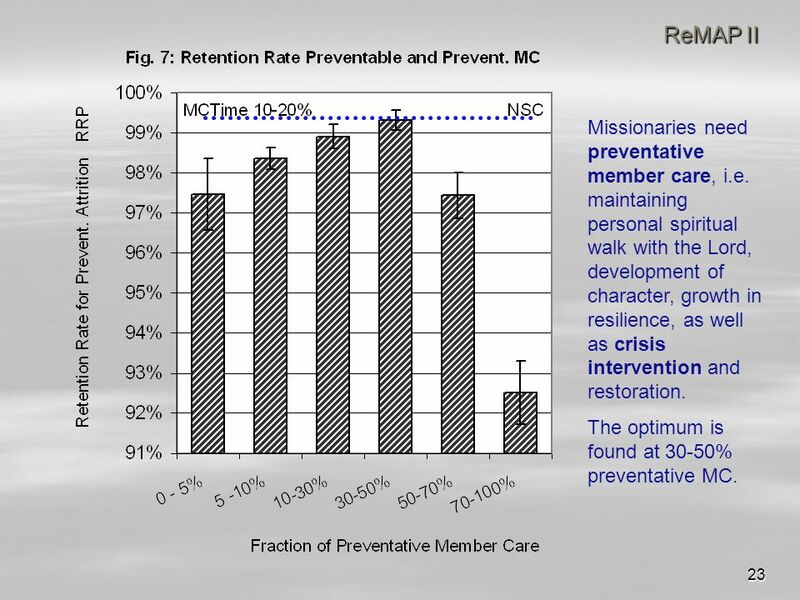 23 23 ReMAP II Missionaries need preventative member care, i.e. maintaining personal spiritual walk with the Lord, development of character, growth in resilience, as well as crisis intervention and restoration. The optimum is found at 30-50% preventative MC. 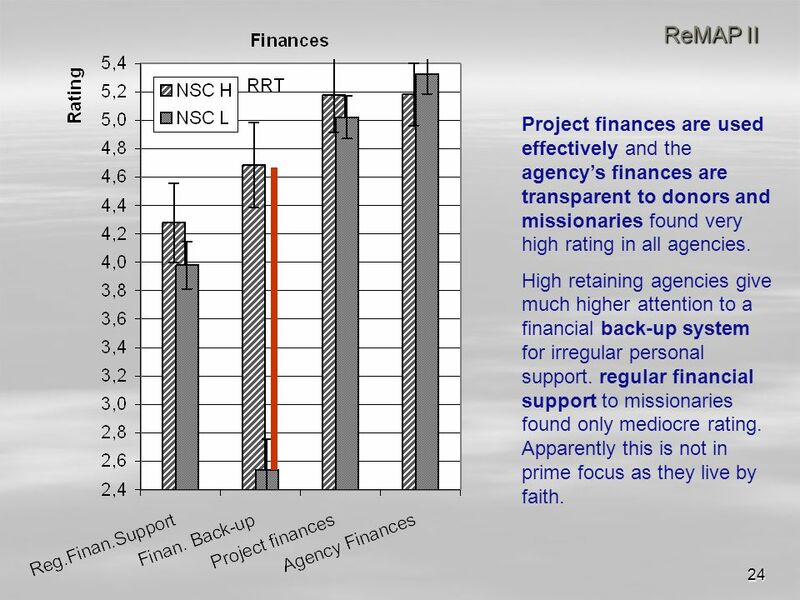 24 24 ReMAP II Project finances are used effectively and the agency’s finances are transparent to donors and missionaries found very high rating in all agencies. High retaining agencies give much higher attention to a financial back-up system for irregular personal support. regular financial support to missionaries found only mediocre rating. Apparently this is not in prime focus as they live by faith. 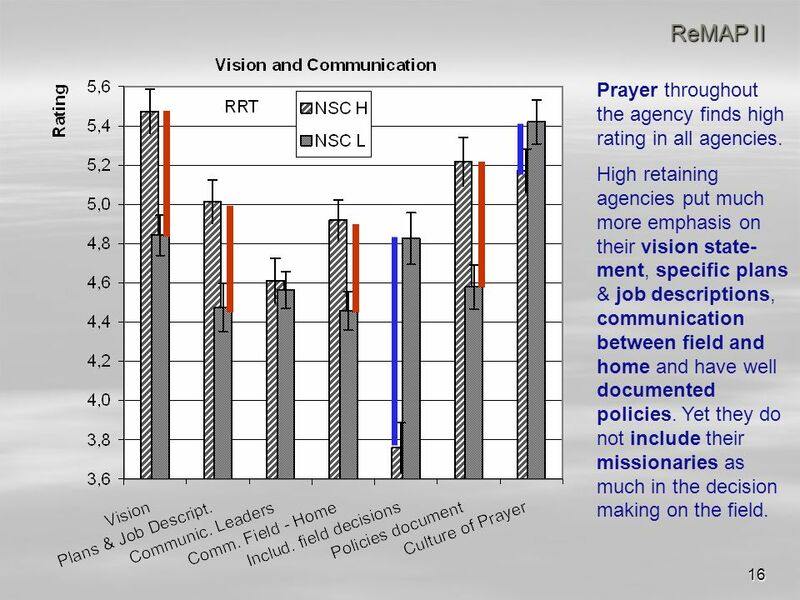 25 25 ReMAP II Prayer of the agency home office for their missionaries found very high rating in all agencies. High retaining agencies give much more attention to pre- field screening of candidates. 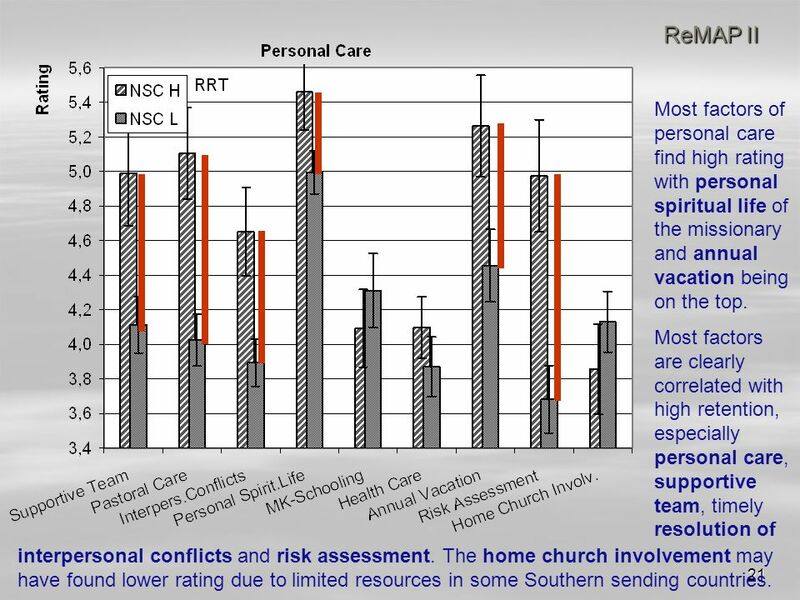 Debriefing of missionaries coming on home assignment and re-entry program found very low rating (and even a negative correlation), probably because of the young age of the mission movement. This is probably one of the neglected areas that need further improvement. 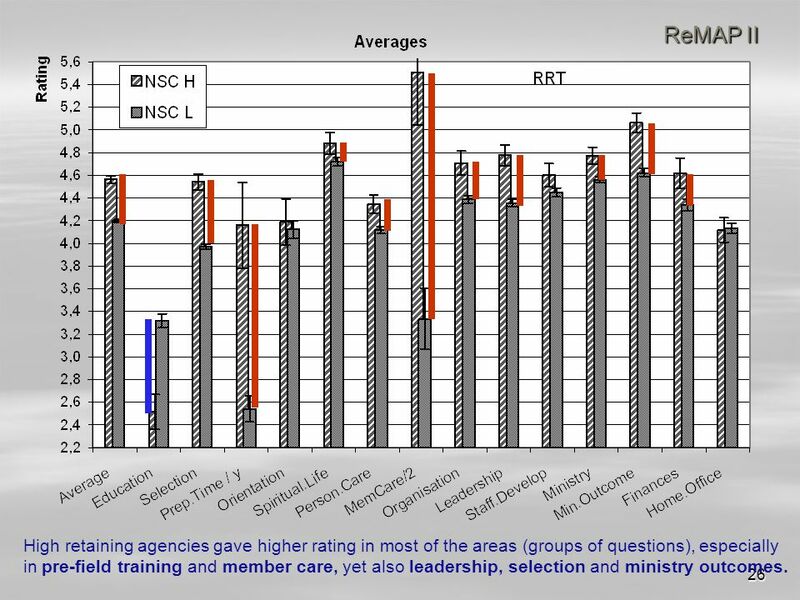 26 26 ReMAP II High retaining agencies gave higher rating in most of the areas (groups of questions), especially in pre-field training and member care, yet also leadership, selection and ministry outcomes. 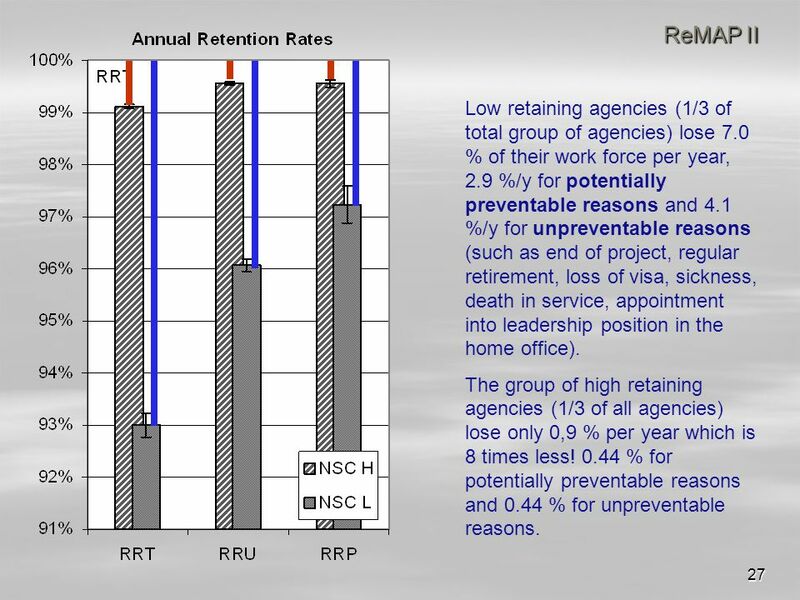 27 27 ReMAP II Low retaining agencies (1/3 of total group of agencies) lose 7.0 % of their work force per year, 2.9 %/y for potentially preventable reasons and 4.1 %/y for unpreventable reasons (such as end of project, regular retirement, loss of visa, sickness, death in service, appointment into leadership position in the home office). The group of high retaining agencies (1/3 of all agencies) lose only 0,9 % per year which is 8 times less! 0.44 % for potentially preventable reasons and 0.44 % for unpreventable reasons. 28 28 ReMAP II Within 10 year these differences in retention rates accumulate to a vast gulf of: 52% staff turnover vs. 8.5 %. 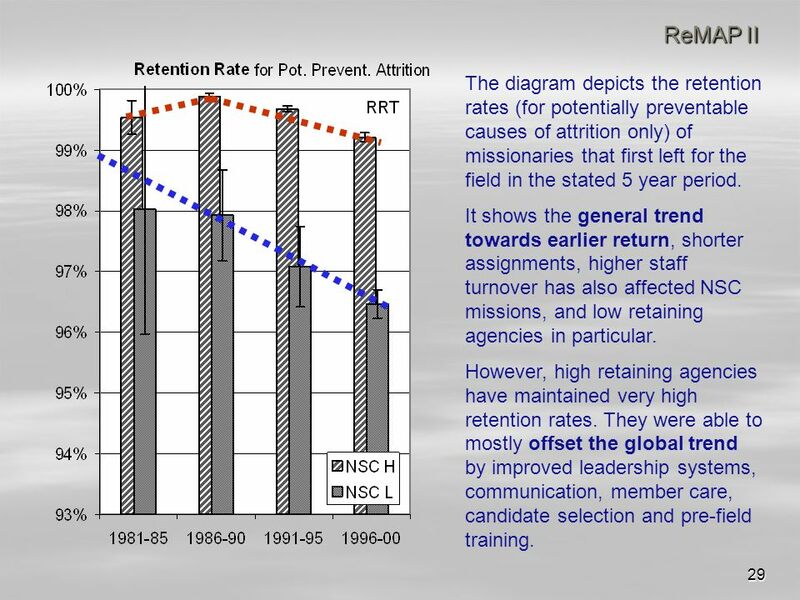 29 29 ReMAP II The diagram depicts the retention rates (for potentially preventable causes of attrition only) of missionaries that first left for the field in the stated 5 year period. It shows the general trend towards earlier return, shorter assignments, higher staff turnover has also affected NSC missions, and low retaining agencies in particular. However, high retaining agencies have maintained very high retention rates. They were able to mostly offset the global trend by improved leadership systems, communication, member care, candidate selection and pre-field training. 30 30 ReMAP II In the years 2001-02 the large group of high retaining agencies showed only ¼ of the number of total returnees as the group of low retaining agencies. 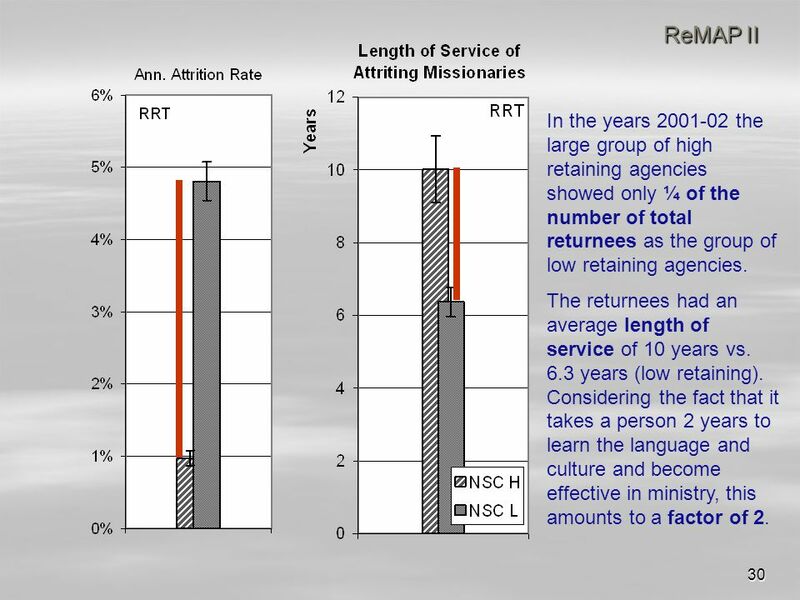 The returnees had an average length of service of 10 years vs. 6.3 years (low retaining). Considering the fact that it takes a person 2 years to learn the language and culture and become effective in ministry, this amounts to a factor of 2. 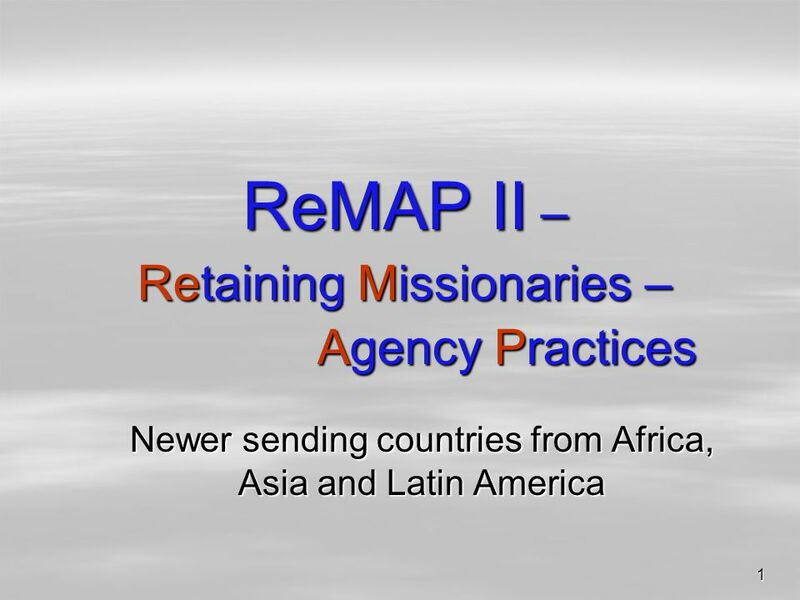 Download ppt "1 ReMAP II – Retaining Missionaries – Agency Practices Newer sending countries from Africa, Asia and Latin America." Revised criteria for the Order of the Ministry. The personThe work  Qualifications ◦ 10 qualities anticipated in persons engaged in ministry in the CCDOC. Parvaneh Rabiee, Kate Baxter, Gillian Parker and Sylvia Bernard RNIB Research Day 2014: Rehabilitation and social care RNIB, 105 Judd Street, London 20. Natural Church Development Making it happen in my church. Ministry Health Check Combining God’s call with good practice to produce Kingdom excellence Church: Ministry: Date: Completed by: Copyright © 2011 Newfrontiers.